If you're getting married, you need to prepare yourself for a hefty price tag for the event. According to a 2017 survey by The Knot, the national average cost of a wedding is $33,391. Few people have that kind of money in the bank, so many couples turn to credit cards or loans to finance their dream wedding. Luckily, there are ways to trim that total cost down. With a little planning, you can have a beautiful wedding without blowing your budget. 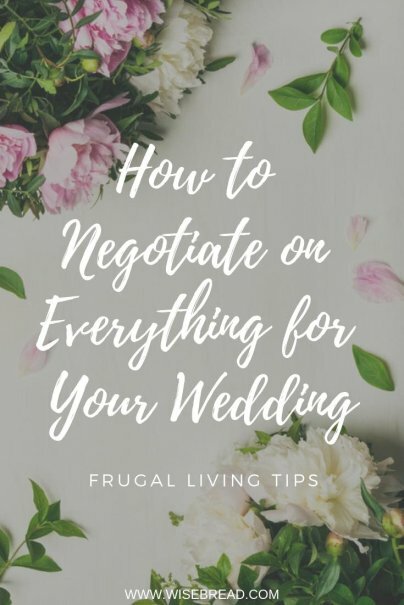 Here are eight tips for negotiating with wedding vendors and getting the best deals. Vendors have high expenses themselves, including staff and supplies. Although they may have some wiggle room in their quotes, you shouldn't expect them to slash their quotes in half. When it comes to planning your wedding, prioritize what's most important to you and cut back on the rest. For example, if you treasure photos and look forward to having a beautiful wedding album, set money aside for a really skilled photographer. However, that might mean you have to make other sacrifices to stay within your budget such as skipping a videographer or going with a less expensive wedding cake. Traditionally, couples use restaurants, established caterers, and brick and mortar florists for their weddings. However, many independent cooks and artists offer their services for weddings, as well. Because they don't have the same high overhead costs as a traditional store, their prices are often much lower. And, they may be able to work with you to come up with ideas that fit your budget. Use MyWedding's database to find vendors of all sizes near you. Or, you can also use Etsy for flowers and centerpieces. By messaging a seller directly, you may be able to negotiate a discount for large orders. Once you have a list of potential vendors, ask multiple companies for quotes based on your budget. Compare the offers carefully to ensure they're offering the same things; a higher priced quote might actually include more — and be a better deal — than a cheaper vendor. When it comes to venues, photography, and flowers, you might be able to save money during the off-season. Weddings in the late spring to the early fall tend to be the most expensive, while winter or early spring weddings are often cheaper. For venues, you could save up to 30 percent by having a winter wedding, according to wedding planner Angela Christoforo, owner of Elite Wedding & Event Planning. When the wedding season is slow, vendors might be willing to take on work for less than their typical rate, since they'd otherwise not be booked at all. Plus, you can save more money by adjusting your plans for food and flowers based on the season. By focusing on seasonal produce and flowers, you can reduce your costs. If the vendor isn't willing to negotiate, you might be able to save money by being flexible. By being flexible with things like flower choice, entrees, or even the wedding date, you can save money. For example, if you're willing to have your wedding on a Friday instead of a Saturday, you could dramatically reduce your bill. Ask your vendors for a comprehensive list of fees before signing any agreement. You might find that there are additional wedding costs you weren't aware of, such as bottle opening fees or trash disposal charges. In some cases, you may be able to get the vendor to waive some of these fees, making the cost more affordable. When negotiating with vendors, make sure you remain calm and polite. Vendors are more likely to accommodate you — and be more willing to adjust their prices — for respectful clients who are honest about their budgets while also respecting the vendor's work and bottom line, too.